On arrival at the Airfield please check-in at reception. After your formal safety lesson with an experienced instructor you will then be ready to take to the skies. On your 20 minute pre-boarding call you will meet your instructor who will prepare you for your skydive - fitting of your jumpsuit, head gear, goggles (suitable for contact lenses/glasses), gloves and harness. Once aboard our aircraft''The Black Beech 99''(the fastest and most comfortable in the UK), you will be securely harnessed to your Instructor as you ride up to 15,000ft above sea level (the highest in the world without O2), taking in views above one of the most scenic Drop Zones in the country - including the South and North Devon coastlines, Cornwall, Somerset, Dorset and the Bristol Channel to South Wales! Once at altitude and we get the green light for 'GO!' you will experience the most exhilarating, adrenaline pumping moment of your life as you and your instructor edge towards the door and your ears are filled with the rush of air. As you exit the aircraft you will experience speeds of 120mph as the adrenaline rushes over you for up to a full minute, freefalling up to 2 miles!! Enjoy the freedom of this awesome sport. As the large canopy unfolds, you will become aware of the sudden tranquility allowing you to talk with your instructor and take in the beautiful scenery during the parachute ride lasting up to 5 minutes. Help your Instructor steer the parachute around the sky before gliding back to the airfield. 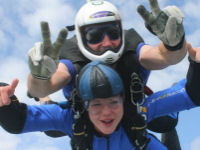 Feel the natural high that Tandem Skydiving will bring! Should the weather be unsuitable for jumping on the day it is your responsibility to return to the parachute centre on another occasion(s) if necessary, to complete your jump. You must rebook within 90 days of each unsuccessful attempt. Parachuting is an adventure sport and participation in such sports necessarily involves a risk of injury or death regardless of the standard of training, supervision and equipment employed. The standard upper weight limit is 15 stone / 95 kilos fully clothed. Please call the office if you are between 15 and 18 stone. The minimum age is 16 years and there is no upper age limit. If you are aged between 16 and 18 you must obtain a parent or guardians consent. If you have any medical conditions or are aged 40 or above you must consult your GP to sign and stamp the BPA medical form.This will be sent to you with confirmation once a booking has been confirmed. Please bring these forms with you on the day of your jump (do not post), without these forms you will be unable to jump and you will lose your deposit. We are happy to take people who are deemed 'safe to jump medically' by their G.P. or consultant, even if they suffer from a medical condition/s.